The Secret Business Lives of Footballers #Infographic ~ Visualistan '+g+"
Clothing lines and sponsorships might be par for the course, but coffee brands, fintech, and video games? If you thought footballers just spent their free time causing scandals, read on… Have you ever wondered what footballers spent all their money on? If you said their WAGs, you might be surprised by the new infographic from SBO. Just look at Ryan Bertrand - your first thought might not be his knack for finance, but you probably didn’t know he was on the trading floor from 18, and has used some of his football profits to set up fintech company Silicon Markets. He even lists it as his primary employment on his LinkedIn profile. But of course the biggest victory of all is Mainz forward Maximilian Beister’s Snaxcup – a vital piece of football-watcher gear that combines a plate and a cup to ensure you can carry both in one hand and use the other for a giant foam finger. A set of 25 costs only £9.50… Don’t all rush to buy them at once. 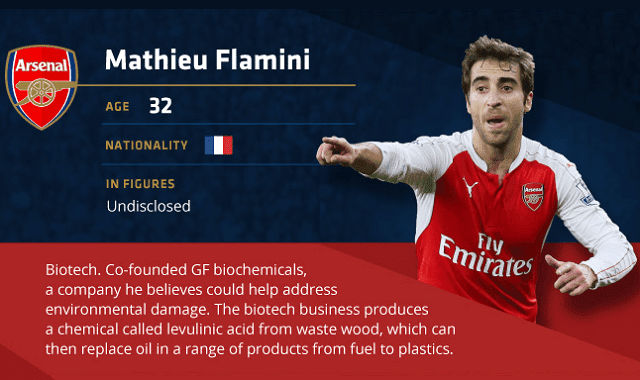 So if you thought Pelé’s only money-makers were football and books about it, or if you’ve ever wondered what Mathieu Flamini’s contribution to environmental science has been (and haven’t we all) then check out the full infographic here to see just how much you’ve been underestimating the sport’s biggest names.